A person who is unconscious, even someone who has been in a long-continued coma, can be helped using a process called an Unconscious Person Assist. With this assist you can help to get the person into communication with you and his surroundings, and so bring him from unconsciousness back to life and livingness. It is an easy assist to learn and to do. The theory of why assists work includes three factors. The first is control and direction of attention. The second is location. The third is time. The injured or ill person remains ill or injured because there is something wrong with each of these three factors. His attention is not under any control, he is located thoughtwise elsewhere and he is not in present time. He is in the past. The problem of someone who wishes to help with an assist is how to control the person’s attention, get the person located here and into present time. 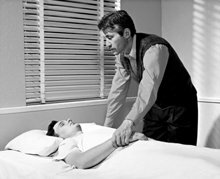 By having the unconscious person touch nearby things like a pillow, the floor or his body (without hurting an injured body part), you can help bring his attention under control and bring him into present time. The process is feather-light, but it can reach a long way down. 4. Give the next command and move the person’s hand to touch another object. 5. Continue giving commands, moving his hand to the next object and acknowledging. If you are handling a person in a coma, you may not get him back to consciousness in a single assist session. What you look for in such a case as a signal to end the session is an improvement in the person's condition. There are various indicators which will tell you you’ve gotten an improvement. The person’s breathing may be easier; his skin tone may improve; he may simply look better or more comfortable than when you started that session. Watch very carefully for such indicators. They show you are making progress. When you have an improvement on a person in a coma, end off by saying “That’s it for today” and let the person know when you will see him for the next session. Having the unconscious person touch nearby things like a pillow, a blanket or his body can help bring his attention under control and bring him into present time and back to life and livingness. A signal system can be arranged with an unconscious person in order to question him and get “yes” or “no” answers. The signal system is simple: clasp the person's hand gently in yours so that he can squeeze it. Tell him, “You can answer me by squeezing my hand. Squeeze once for ‘Yes’ and twice for ‘No.’” You can then ask simple questions to find out if you have gotten an improvement: “Can you hear me?” or “Do you know where you are?” The person will usually respond, if faintly, even while unconscious. If there is no response or a negative response, continue with the assist session. This system is especially useful when giving an assist to someone who is in a coma. Say you notice a change in the person during the assist, such as his eyelids quiver or squint slightly. The signal system can be used at that point to ask the person, “Do you feel any better?” or “Do you know where you are?” If you find he’s improved, you end off that session, otherwise continue on until he does have an improvement. Another example of the use of this system would be in starting an assist session on someone in a coma whom you've been giving regular assist sessions to. At the start of such a session you can establish the hand-squeeze signal system and ask the person, “Are you doing any better today?” or “Are you doing better than when I was here last?” Whatever response you get (short of the person coming back to consciousness right then and there), you still go ahead with the Unconscious Person Assist until you have an improvement for that session. You may have to put in control on the environment before the assist can be started. For instance, if you were doing the assist in a hospital you would need to ensure that the medical staff would not interrupt you when giving the assist. The assist is complete when you have the person back to consciousness. This may happen rather rapidly or it may sometimes require many sessions before it is achieved. Your job is to keep at it, taking each session to an improvement for the person. When the person is conscious again the assist is ended, but this is not the end of your handling of him. It means you can now move on to other assist actions and processing. This simple assist can bring back life and livingness to an unconscious person. When done correctly, the result can be the greatest magic anybody ever saw!